lies a third stream of writing, chatty, yet based in scholarship, geared to a theatre-going, if not theatre-practising reader. 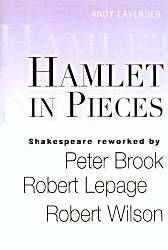 Two new books, Andy Lavender's HAMLET IN PIECES and Patrick Tucker's THE SECRETS OF ACTING SHAKESPEARE, THE ORIGINAL APPROACH are two such books. "pre-text" for reinterpretation. The play, with its iconic and canonic status, possesses "several resonant post-modern fancies...: a refusal of closure, a taste for mind games, a liking for play and a penchant for metaphor rather than literalism" that make it a prime target for de-construction. beginning with Brook's Paris workshop of Qui Est La, a meditation on theatre and threatricalism that included not only snippets from the play, but quotes and exercises based on the works of several major Twentieth Century directors, including Brecht, Stanislavski, Artaud, Meyerhold, Gordon Craig and Zeami Motikoyo, the medieval Japanese Noh master. Lavender is, as is much of the theatrical world, in awe of Brook, not only because, when, shaking his hand at a first meeting, he realizes that "the hand you are shaking has shaken then hands of Barrault, Brecht, Craig and Grotowsk...", but also because of Brook's disciplined approach to his craft. an end, it is obviously not just putting on a play." than is Brook, with his Zen-like, ascetic playing space. by a privileged cultural elite. brilliance of the three men at work, the book leaves us with the vaguely sad feeling that all this time, talent and effort will never a reach a large, popular audience; that these artists are working in an increasingly irrelevant art form. launching a successful directing career in theatre and television in England, reports on his findings in a detailed (too detailed, really) way, providing us with all we want to know about what he does. believer in the validity of the 1623 First Folio as an acting text, and of "cue scripts" (where the actor only has his part and the word or two that cues him in) as the way to gain insights into acting Shakespeare. Tucker argues, passionately and with wit, for faithfully following the playwright's intentions, which he claims can be found by close, nay, scientific, scrutiny of clues and tips embedded in the text. And there is method in his madness. If you only have your part, you, the actor, have to be fully focused and alert on stage, totally present, so yes, scene work, and even one or two performances of a play done this way, brings a kind of energy that you might not get after six weeks (let alone several months) of tinkering with the texts. (Of course, the freshness goes away after several performances in a modern theatre). 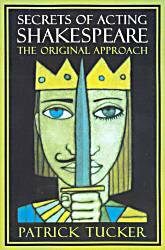 And, yes, Shakespeare did give plenty of staging clues within the texts of his plays, but these can be found through careful reading of the whole play as well. And his admonition not to trust to editors, as a comparative reading of several editions of any one play will prove, is well founded. But, here's the rub. makes Tucker's a book worth looking at on those over-crowded shelves.